I realize because I've done it that a lot of journalism is lazy, that's to say just researched at the desk by googling things. And this behaviour with its sometimes interesting but never verifiable findings is typical of the modern writer's lifestyle. I think that's why every so often I write about nature. Even though much of what I say is still second-order information sourced from books or the internet, still the fact is that I did see the plants with my own eyes, and here's the photo to prove it. Something was real. And it was that real contact that I wanted to report; but even then it isn't easy. To describe the real moment. So quite often I fall back on related material that I've read somewhere else. And I just hope that what I'm writing manages to convey some little breath of that true moment about which, so often, I feel so tongue-tied. What is a forest? For me the idea contains reassuring elements of darkness and infinitude, that is, uncountableness. Levin, of course, reproves his brother-in-law's vagueness. No, a forest isn't really infinite. A merchant always counts the trees before he buys. I supposed I had no brothers. And indeed I don't. But when I listened to my first vocal overdub I was surprised by the effect it had on me. It sounded like I had brothers. We were singing a country song and we sounded like crooning cowboys. 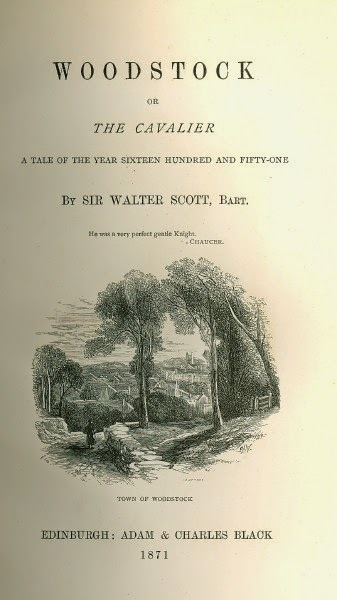 Sir Walter Scott: Tales of a Grandfather, Marmion, etc. 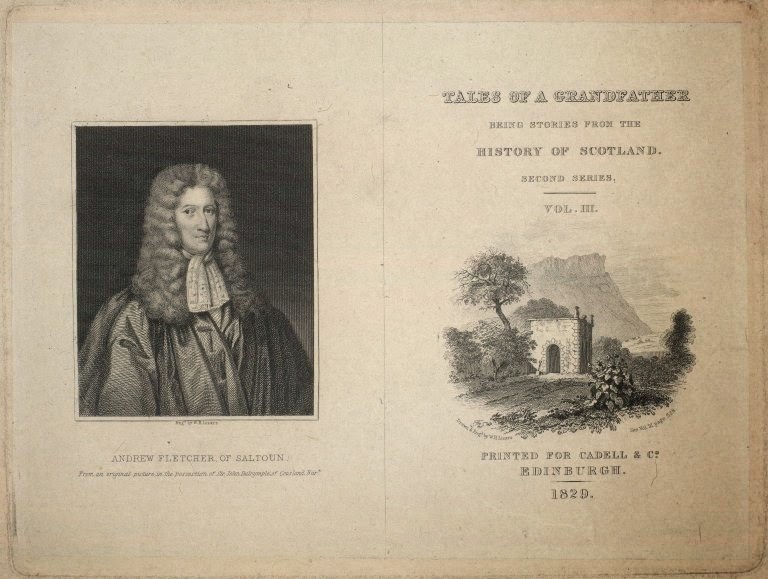 Tales of a Grandfather is a history of Scotland up to 1745 - at least this is the bit that people usually talk about, and it equates to the first three series; there was a fourth series (1831) on French history, and an abandoned MS of a 5th series, continuing the French history. The abandonment may have been related to Master Littlejohn's death at ten years old. He was the grandchild addressed in these volumes, though Scott didn't except in the early pages make much concession to infantile capacities. He does however dwell on memorable tales (even if legendary) and he steers clear of analysis. Until quite recently this was a widely-read book in Scotland; it makes a bizarre appearance in the Sensational Alex Harvey Band’s Tomorrow Belongs to Me (1975) – Harvey (born in 1935) made a virtue of being older than other rock stars and of having access to forgotten things. The History of Scotland (for the Cabinet Cyclopaedia) covers a briefer period, ending in 1603. This is harder to come by, but it makes better reading than the first series of TOAG, which covers the same ground. Both however are good books, if this kind of historical material interests you; in other words, wars, power-struggles, heroic and villainous deeds; not much about social or cultural matters. TOAG Chapter XXXIV (the first of the second series), is titled “Progress of Civilisation in Society”. It’s on such a theme that one gains from the clarity enforced on a writer who addresses a child. This is what most of Scott’s contemporaries thought, if they thought at all, but rarely had occasion to say: for example, about the origin and function of property, money, trade, social class and education. It’s interesting that Scott mentions peoples who did not know about boiling water (natives of New South Wales) or even making a fire (presumably the Tasmanians, at that time still in existence). The action of Woodstock is extraordinarily concentrated on its titular location; we are mainly inside the Lodge, almost as often in the grounds, sometimes in the town, but the only time we get any further afield during the main narrative is when Wildrake meets with Cromwell at Windsor (Chs VIII-IX). This scene (which Lockhart ridiculously called better than Macbeth) is certainly a fine one and it sets up a touch of menacing expectation; at some point we know we will see more of Cromwell. Somewhere at the back of the reader’s mind is the persistent feeling of “I’ve been here before”. Thus when we attend the planned duel of Charles and Everard in Chapter 28, we feel the weight of accumulated combat: this very pair have already crossed swords at the end of Ch 24, Wildrake has mimed a combat with Harrison, Henry Lee has fenced with Tomkins. These clashings have always come to nothing, but the sensation grows that someone, sometime, is going to get themselves killed out here. And that is in fact what’s about to happen, when Joceline’s quarterstaff smacks into Tomkins’ temple. When I wrote my mini-critiques of Scott’s novels, I was rude about this one and I still think I’m right. The praise accorded it in the book by Angus and Jenni Calder seems inexplicable to me, unless they were dazzled by its reception in Europe. For all that, it’s a book that can be read, just. The awful judgment of a critic - was it Taine? - that Scott is “tame” is not easily shrugged off, yet the critic perhaps didn’t fully appreciate Scott’s anti-heroic instincts. It occurs to me too that Scott’s interest in royalty is associated with a determination to view the behaviour of a human being when untrammelled by institutions. In the Duke of Burgundy and King Louis he has his chance. These were exceptional lives in their own time, but ours have more in common with them than with the merchants and soldiers. We don’t have all the wealth, but we do have nineteen parts of the freedom. We too can become our own personalities. 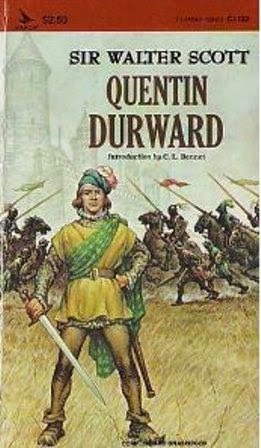 C.L Bennet’s (of Dalhousie University) comatose 1967 introduction to Quentin Durward betrays how unrewardingly Scott has been read for at least a century, and what an increasingly ungrateful task popular publishers found it to present Scott classics. This copy, “specially selected for the Airmont Library from the immortal literature of the world”, appears as usual never to have been read. 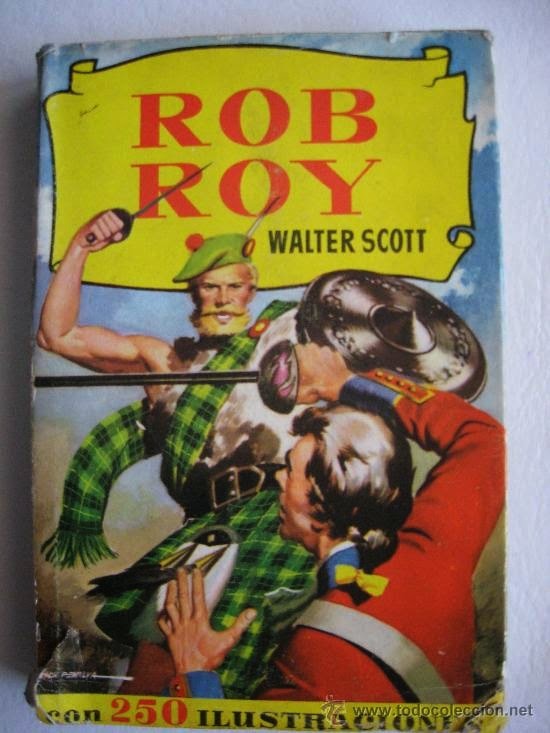 There are after all considerable obstacles in the path of one who may have been attracted (or whose gift-buying relative was attracted) by the front cover, with its muscular hero (in an astonishing costume of Ivanhoe-meets-Rob Roy) posing heroically while a pitched battle engages furiously a few yards away. After Bennet there is Scott’s 1831 Preface which, with some seriousness and some dullness, and a full page of quotation in French, moralizes over King Louis XI, dispiritingly adding: “It will be easily comprehended, that the little love intrigue of Quentin is only employed as the means of bringing out the story” (as poor a piece of salesmanship as Henry James’ remarks on the mechanism of The Ambassadors). This is one of the later Prefaces that ought now to be relegated to an appendix, because it destroys the effect that Scott first aimed for. He was not one of those rare artists (like Brahms) who could add new material so seamlessly that we are convinced the whole work was built around it. “By Heaven, Catherine, your tongue wears as many disguises as your person!” Roland Græme complains of the girl he loves. He’s mistaken, for the “audacity” that we admire in Scott’s most entrancing heroine is not deceptive at all, though admittedly she does try to take advantage of the Lady of Lochleven’s belief in a supposed poisoning. The circumstances are a bit unusual. Normally Catherine is, whatever Roland thinks, perfectly sincere and direct. 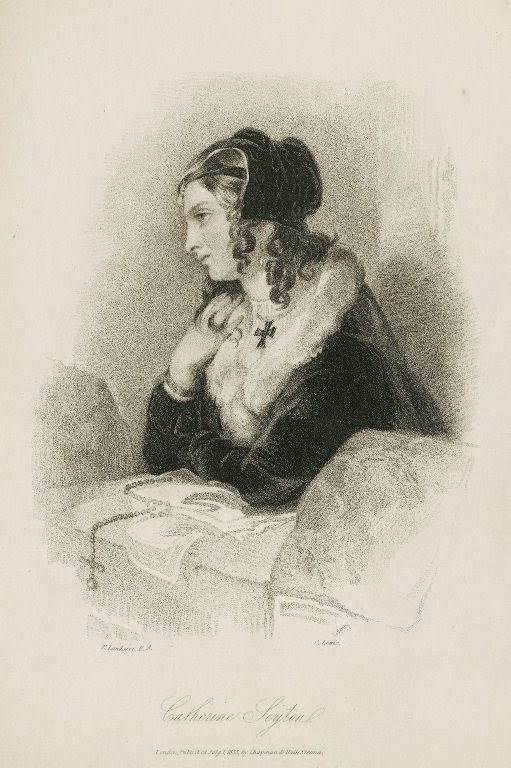 Her games are the spiritedness of youth, and “in sad earnest” she hardly troubles to hide even her love for Roland, and certainly never her unalterable commitment to the Catholic faith. Scott’s most attractive women (Flora MacIvor, Rebecca) are for some reason often committed to a creed he disapproves. The Abbot is indeed a book full of even more than the usual quota of people in disguise. In the village of Kinross, Roland encounters four in very short order: Henry Seyton as a country maiden, Magdalen Græme as Mother Nicneven, Father Ambrose as a “mean and servile” retainer, and Father Boniface as the gardener Blinkhoolie. All are of course adherents to the “ancient and only road” (Mary’s phrase) that the ruling Protestant party is trying to suppress. Disguise has the potential of allowing someone to assume a character that expresses their inner selves more openly than their everyday identity does, and here this might be claimed (in their different ways) of both Magdalen-as-Nicneven and Boniface-as-Blinkhoolie. Pursuing that line of thought as regards Henry is intriguing, but the truth is that whenever Roland tries to treat Henry femininely he walks into a wall. This seems maybe like a crude device for nourishing an artificial mystification in Roland’s mind; he keeps mistaking Henry-as-maiden for Catherine, his supposedly “identical” twin, and there seems no good reason why the real Catherine doesn’t enlighten him. (Roland is apparently unaware that Catherine has a twin at all, even though Henry Seyton is a prominent noble.) The upshot is an androgynous tangle that links the three in features of their personalities. But what is “audacity” in Catherine is impulsiveness and violence in the two young men. I have finally re-read Rob Roy, and found myself pronouncing it a failure (albeit one written in the midst of Scott’s best period). If so, it’s an interesting kind of failure. The author of Waverley was, as that book sufficiently shows, an innovator by nature. Rob Roy’s failure is the sort that only innovations are prone to. It‘s a travelling book, the locale shifting as the book proceeds. In that respect it’s like Waverley or Guy Mannering. This is familiar from picaresque novels, but Scott’s novels are not picaresque novels; they seek a unity of purpose that is different. Or, one could speak of a “narrative logic” - and therefore, potentially, a failure in that “logic” - that is not courted by picaresque novels. Besides, in the picaresque novel the travelling is a device. The stage backcloth moves but the hero never gets to a new country. When Scott began to make Scotland seem Scottish, that was the end - for the moment, anyway - of the picaresque novel. With Tales of My Landlord, Scott took the opportunity to break free from the already-palpable constraints of being "the author of Waverley" and travelled back a lot further than 60 years; Old Mortality takes place 127 years since. Nevertheless, of all his novels it was the one that stirred most political debate in Scotland. When Scott put the Covenanters stage-centre, he was writing about a historical group who had in recent times become a political symbol of resistance to government tyranny, e.g. for the textile workers who assembled at Loudon-hill in 1815 to celebrate Napoleon's escape from Elba. 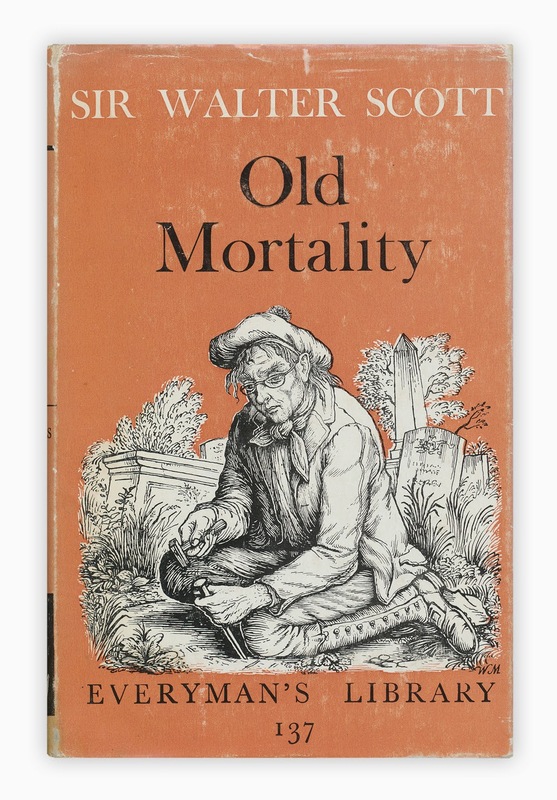 In fact the narrative that follows certainly does not look as if it could have had any basis in such tales as Old Mortality might have spun, except very sporadically, as perhaps in the heroic account of MacBriar's torture and execution; Scott, once he starts to write the story, doesn't attempt to make it reflect the complicated provenance that he has imagined for it in the frame.